Only the best ... Jamaica Blue Mountain 'peaberry' coffee beans are roasted until they're crunchy, then liberally coated with rich creamy dark chocolate. J. Martinez' dark chocolate covered coffee beans are available in one pound packages. 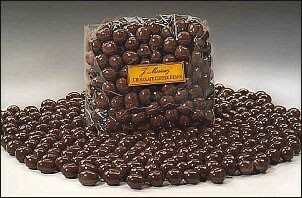 We also offer Milk Chocolate Covered Coffee Beans.